I went to the Ozimals sim preview, it was fabulous!! I’m going to start with my favorite spot first.. I forgot what it’s called but it had a great Alice in Wonderland style party area full of cakes and tea/coffee? YUM! 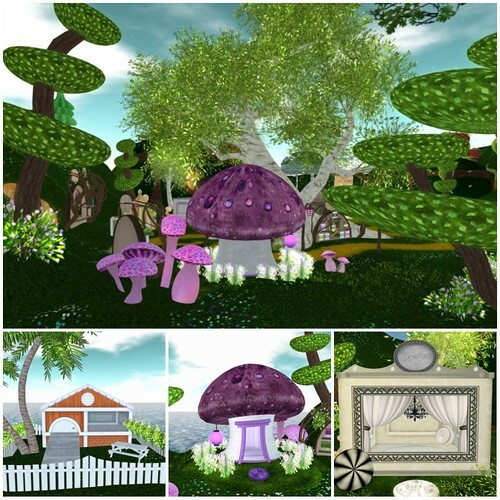 Check out these posh bunny homes, a collaboration between Callie Cline and Barnesworth Anubis, they’re so cool! I wish I could live in them! These are the Ozimals pet bunny — so cute? Like hamsters. Munchh Munchhh! The Ozimals sim had lots of areas to explore! Left: Marsh area; Right: my friend Lashy in her AVATAR, hah! they match!! 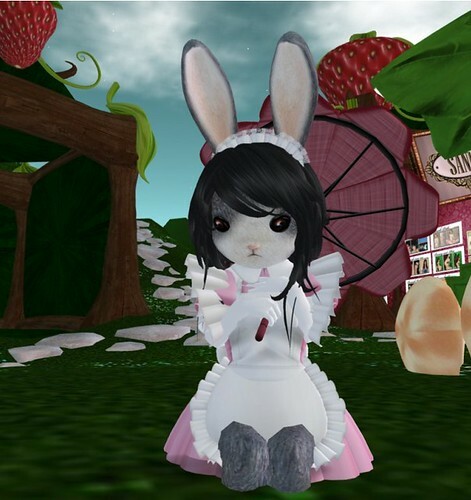 I spotted this adorable bunny avatar hanging around. I forgot her name, but her outfit was really cute. My tour of the Ozimals sim ended back where I started, at the main store. Check out these pajamas! And of course, you’ll need a can of Red Bunny after all the exploration. Get it? 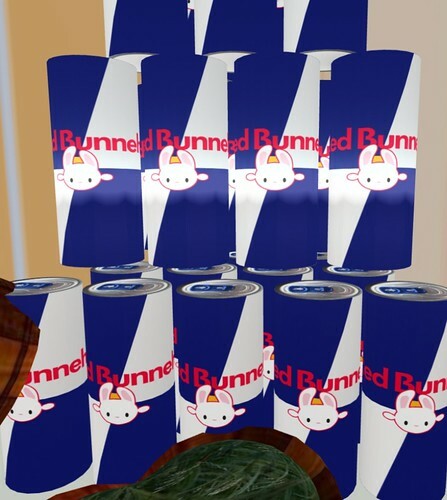 Red Bull.. Red Bunny… cuute! the new things u add 😀 ..
mmm i’m wondering from where ur friend got her avatar looks like AVATAR? I have to say that I am REALLY disappointed at how they copied Red Bull’s design. I consider that to be an infrigment to copyrights. Seriously when you have money to create bunnies, you should make your own things and not feel free to copy big companies’ stuff. I am reporting them to Red Bull. I am sure they paid graphists millions for that design and wouldn’t want a bunny stuck on their brand. And yeah their sim is cute blah blah but they are greedy with their insane prices. 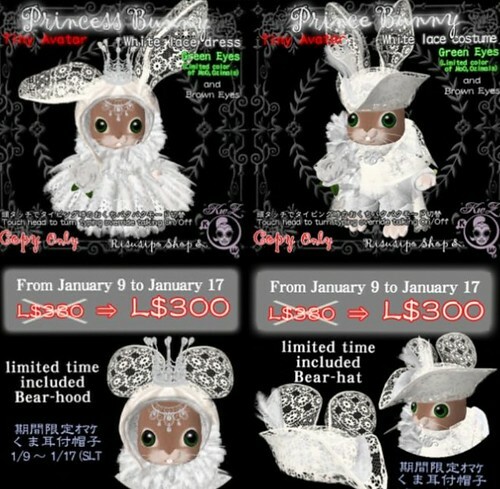 Who wants to pay that much for a virtual bunny o0?? Hi Disappointed, the sim is cute but I don’t own any bunnies either. I’m more into Zooby babies. 1. Clearly the concept of “parody” is lost on you. Just to defend creating a large scale product like the bunnies: Maybe you think scripting an object that is complicated as the bunnies are super easy. Clearly you’ve never done something on such a large scale all keeping sim resources in mind. The work that went into the bunnies cost real money- programmers are not cheap, nor should their services be cheap. The problem with a micro economy like SL people think Real World services should also live on the micro economy scale but that’s not the case. A good coder can cost upwards to 100 bucks an hour not to mention imagine creating these bunnies under the strict scripting lines within Second Life. So be disappointed all you want, say what you want, but for the people who understand the hard work involved on the front end and on the back end of any large scale project done in SL they know that the prices for the Ozimals are pretty darn reasonable considering it will take months to get the money put out back and break even. As for the Red Bull. Feel free to send something to the copyright owner. I’m a full believer in informing copyright owners when their trademark/copyright has been infringed on within SL or RL. I have done it myself for both SL creators and to RL companies. The only difference is you’ve never heard me piss and moan on a blog comment about how someone is “WAH INFRINGING COPYRIGHT” just send them a notice and let the true owner that is being infringed deal with it. I spend a lot of money in SL… I do not mind spending money at all in there. In fact I buy lindens to dress myself and I barely ever wear anything twice. But seriously paying 1k for food per week per bunny??? really you find that reasonable? Oh and parody huh? ok well I guess as a creator myself, I would be seriously pissed off to see my design used this way.